Hackney Cyclist has just drawn attention to Whiston Road, a ‘Quietway’ the forms part of the Central London Grid. As it happens I cycled this morning on another ‘Quietway’ that forms part of the same network, this time in the City of London. 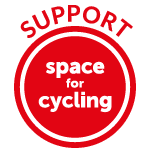 It’s a short section that runs from Farringdon Road (where it meets, or will meet, the North-South Superhighway, CS6) and then runs east through the Barbican into the City of London. I have to say, it is not very good, and as poor a use of money as the Whiston Road scheme, at least as far as enabling cycling (which is what cycling schemes should be doing). Here’s the section I cycled, with the red arrow indicating the obvious desire line. The first problem is actually getting onto it, at the western end. At the moment there isn’t any help at all; you have to ‘negotiate’ out into a stream of heavy motor traffic as you pass under Holborn Viaduct. Once the extension of CS6 is built here, there will be an ‘informal’ crossing here, with an island offering some (but not a lot of) protection in the middle of the road. I was in a small ‘peloton’ of around 20-30 people, and the first thing I noticed is that not a single person opted for the ‘Quietway’ route – everyone else cycled straight ahead, through Smithfield Market, rather than turning right to join the Quietway. Almost immediately we meet our first ‘Give Way’ – having to yield to traffic heading down the hill from the Market to Farringdon Road. The geometry of the road here means the traffic is travelling pretty fast. We’re then onto Hosier Lane, across the road, which is actually a filtered street – usually with bollards at approximately the halfway point, but (currently) thanks to some construction work at the end of the lane, where cycle access has (just about) been retained. But again, we have to give way at the end. And then give way again. The markings here appear to be wrong – if you are following the Quietway, at least, you should turn left. You then have to meander your way through this area – not too bad, but far from clear and obvious, and again, you have to give way to traffic which is crossing your path, and then give way again to rejoin the road on the far side. Before having to yield to oncoming traffic to turn right into Cloth Fair. Which is very narrow, and not particularly brilliant if you meet motor traffic coming the other way. It really doesn’t make sense to me to route an (allegedly) major cycle route in central London down these kinds of tiny streets. This isn’t going to work. What’s that at the end? Another give way. And then we’re finally back on the road that we were on initially. This is a dead straight line from where the road meets Farringdon Road, in the first photograph, but instead of following that alignment, the Quietway has meandered all around the houses (literally!). This wouldn’t be so bad if you could make uninterrupted progress, but not when there are so many give ways, and turns, and points at which you get could lost. What is doubly baffling is that the ‘Quietway’ then becomes a pretty hostile road, once you have passed through the Barbican. This is the kind of environment that only a fairly hardened cyclist will be willing to tackle, so I can’t quite see the point of meandering around on tiny little lanes to avoid busy roads, when you end up having to cycle on those kinds of roads anyway.The faded painted symbols are telling – give it six months and there will be nothing to indicate this was ever a supposed ‘cycling route’. Which just about sums up the usefulness of this entire intervention. It’s a waste of money. It’s not good. I expect they looked at the volume of commercial traffic movements on the straight road thanks to the meat market and just gave up in favour of this impractical backstreet route. Is this is a Sustrans route? This is even worse than the current western Quietway planned from the NW corner of Kensington Gardens (the Diana Playground area) to Sussex Gardens (Marylebone). It involved the Royal Parks, Kensington and Chelsea AND Westminster, so was probably doomed from the outset. It requires north/eastbound cyclists to leave the park in the opposite direction and then zig-zag up to the Whiteley’s area of Queensway before again zig-zagging across Paddington. No one will use it – it’s ridiculous. The south/eastbound route is slightly different – it filters down a narrow street (Ossington) with cars parked on BOTH sides. So you can be harassed by an impatient motorist and doored from both left and right simultaneously. At least it’s one-way (although it’s probably less safe than the head-on into cars you show above). The map with annotations on the yellow route, is this from a plan or your suggestions?